A fair few years ago now, along with my sister, I had a shop/gallery called The Last Chance Saloon in Waterloo, London. It was one of the first places in the UK that sold/had exhibitions of what came to be known as lowbrow art – a kind of loose movement that amongst other things often mixed pop-art, a kind of graphic cartoonery, rock’n’roll, hotrod-esque and Cramps-esque culture into some kind of mondo swirl. The work of Robert Williams and Juxtapoz magazine would be good starting/reference points. Along which lines, we had the first UK exhibitions by Frank Kozik and Coop but drawing from this side of the big pond we had what I think was the first ever exhibition by Vince Ray (followed by another two). 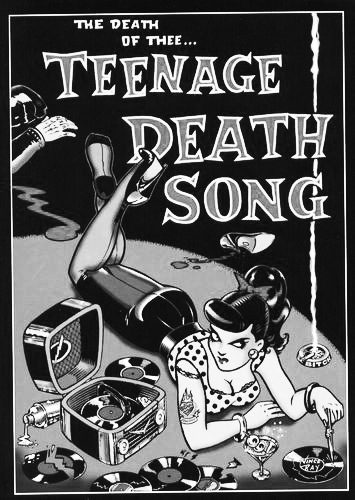 I can’t now remember which of the three exhibitions featured his Death Of The Teenage Death Song painting although it’s one of the few times that I’ve really wanted to buy a piece of original art but I didn’t quite have the money at the time I think. The artwork here is a later version of the painting – I have a vague memory of taking some photographs of the original painting but I’m not sure I did and I’m less sure than that about where they would be if I had. Ah well. I have the memory. Visit Mr Vince Ray in the ether here. Visit The Last Chance Saloon here. Juxtapoz magazine is here. If you should be interested in more along the lines of lowbrow art/graphics then The Graphic Art Of The Underground book could be a place to wander to (and you may well come across a link back to the aforementioned The Last Chance Saloon).